“We are THE BEST COVER BAND in LAS VEGAS 2012!!! As voted on by the intelligent and tasteful geniuses at The LAS VEGAS WEEKLY magazine! We only waited 35 years for this honor… but it’s worth it! Come on . . .admit it, you miss the smooth rock jams of the 70s and early 80s. These are the songs you hum along to in an elevator, sing out loud within the shower, and scream at the top of your lungs when cruising up and down the Pacific Coast highway in that convertible you rented last summer vacation! If you think these experiences were reserved only for those few fleeting moments in time that had you Reminiscing of the good old days, well…that’s What a Fool Believes. If you’re looking for a place that you can sing these songs out loud, with hundreds of others who share in your same Guilty Pleasures, This is It! It’s time to succumb to your desires and join The Guilty Pleasures on your Escape down memory lane. 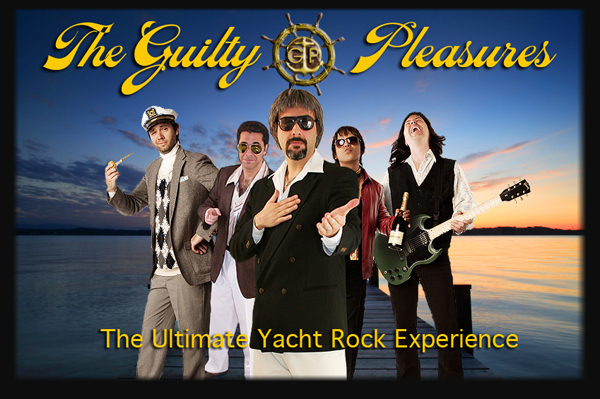 The band sets sail with Captain Anton Neil (drums) at the helm of the ultimate Yacht Rock experience. Enjoying the Summer Breeze with him are deck mates Chevy Chevelle (lead vocals and guitar), Rico Riviera (lead vocals and bass guitar), Rodger Todd (Keyboards and backing vocals), and Special Guest vocalist Michael “Mick” Donald! Stop asking yourself How Long has it been since I’ve truly had a good time? Grab a sparkling glass of Riunite, Steal Away and Ride Like The Wind into the experience of a lifetime. The Guilty Pleasures promise you will wake up onboard the next morning with one thought on your mind . . .”Oh, What a Night! Wanna Book The Guilty Pleasures? You can book The Guilty Pleasures for your next event just by clicking the "Book Them Now" button to the right and filling out the form. We will be in contact with you about their availability as soon as possible.